The funeral service for Irene H. Gjerding, 94, Jamestown, ND formerly of Marion, ND will be at 3:00 PM, Monday, January 7, 2019 at Ave Maria Village in Jamestown. Rev. Marcia Hegna of Marion Lutheran Church will officiate. Burial will be Lakeview Cemetery, Marion. 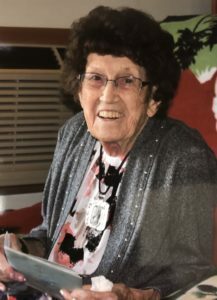 Irene Henrietta Manns Gjerding, 94, of Marion, ND went to her heavenly home on January 1, 2019, while a resident at Ave Maria Village, Jamestown, ND. Irene was born on the family farm on June 16, 1924, to Charles and Clara (Nelson) Manns. Irene ‘Henrietta’ was named after her grandfather (Albert) Henry Manns who emigrated from England to Canada to the USA, homesteading in Manns Township, which is named after him. Irene attended Manns School #1, often staying with her cousin Hazel Ellefson Rasmussen. She attended Montpelier and Greenland High Schools, graduating in 1943. After graduation, she worked as a substitute teacher in country schools and for family and neighbors providing childcare, making meals and working in the fields. On February 25, 1945, Irene married Ivan Gjerding at Litchville First Lutheran Church. On their farm, Irene worked hard washing milk machines, raising turkeys and driving farm equipment. In their home she enjoyed wallpapering, re-upholstering, sewing, and baking. Her joy was loving her five children and attending their activities. In the community, Ivan and Irene were serving members of Marion Lutheran Church where Irene enjoyed Bible Study, teaching Sunday School and making quilts. Irene will be remembered for her ready smile, friendly wave and warm hugs. She was a loving daughter, wife, mother, and friend – a kind and generous caregiver to many. Her faith, family, friends, neighbors and caregivers were important to her. Irene is survived by her brother Charles (Beverly) Manns; her five children Karen (Jim) Larson, Colleen (Tom) Perius, Bonnie Henningson, Becky (Byron) Knudsen and Kaare (Sandy) Gjerding; her grandchildren Jon (Val) and Eric (Shawna) Larson, Darin (Trisha) and Chad (Nikki) Perius, Wes (Kara) and Ken (Cassie) Knudsen, William (Martina) and Nathan Henningson, Tiffany (Chris) Gjerding Larson, Kyle (Beth) Gjerding and Danika (Ken) Gjerding Smith; her great grandchildren Riley, Will, Rob, Elle, Oliver, Vivian, Brooke, James, Emma, Keaton; and many nieces and nephews. She was preceded in death by her husband of 72 years, her parents, her siblings Leslie Manns, Mildred Jones, Clarice Roessler, Margaret Carlson Erickson, her son-in-law Paul Henningson, and her nephew Duane Roessler who, as a toddler, lived with Irene and Ivan.